Hey nana users! How is your music life going? 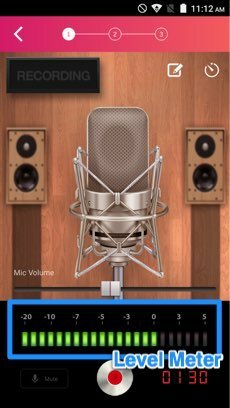 Previously at Part 1, we have introduced basic tips to improve your recording experience. 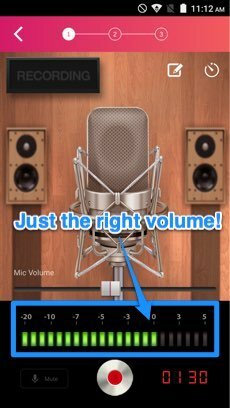 Next tips to be introduced will be the in-app techniques to optimize your sound to max. Looking a bit complex? Actually it’s not that difficult than it sounds, so give it a try! Your sound volume is the important key factor when you’re recording. There is a level meter in nana to observe how much loudness (or quietness) you actually are making. For the initial check of your volume, make sure you test out the part when your volume becomes the largest to see the maximum level that can be recorded. If you see the level meter turning red, it means you’re making too large sound. This will make your sound break, so tone down a little, or take a distance from the microphone. On the other hand, if the level meter is low on green even though you’re making sound, the sound may not crack but the tone will be recorded in desired sound. In this case, make your original volume larger or close up to the microphone. The ideal position of the level meter will be in green color just before it turns red. This is the same when you record with professional mixers at recording studios, so it’s the basics of recording techniques. Do you have the image of the completed piece when you’re recording your track? Since nana’s unique feature is collab, use your imagination how your music wants to sound when you have collaborated with other users. For example, if you’re taking part as a lead vocal, you want to make sure your voice is the main sound to be heard. On the other hand, if you’re are in chorus sound you might not want your voice to hear too large or too small, but balance out the volume with others. Even more, if you’re taking part as a backing guitar, you might not want to interrupt the main track, keeping your tone just to add a taste onto the sound. Remember this when you’re going to collab the sound with other users! When you are done with the recording, next step is to adjust the balance and tone of your track. By adjusting the position of audio fader indicated in blue, you can change the volume of your track and balance it out with the collaborating sound. 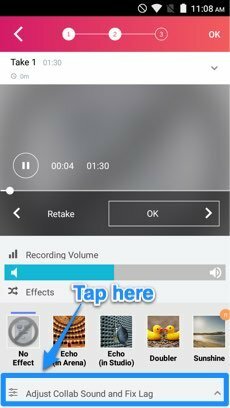 Move it to the right and your track volume will increase, or move it to the left to make it smaller. When you increase the track volume on nana for iPhone, the collab sound automatically decreases its volume only a tiny amount. This is to optimize the sound and preventing it to crack when many users collab on single tune. 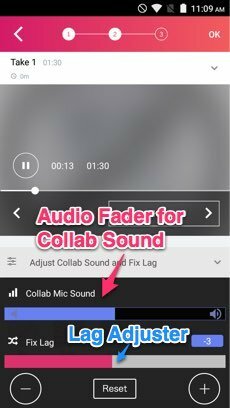 nana for Android can adjust this original volume manually by selecting “Adjust Collab Sound and Fix Lag” bar at the bottom of the effects page. 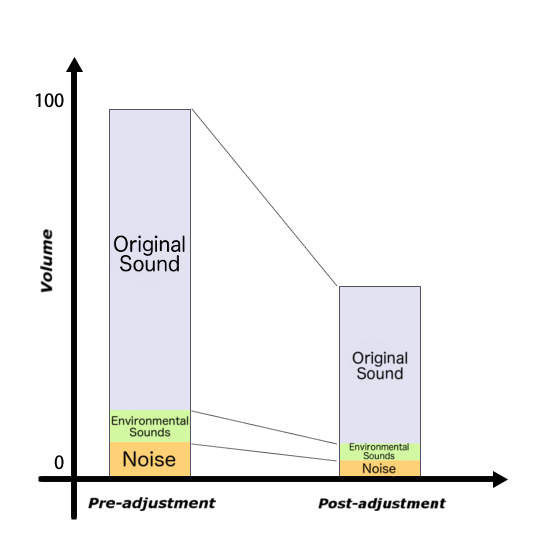 Did you wonder why you should adjust the sound again although you have done it when recording? If you see the graph below, you will understand that there is a proven logic behind this technique. 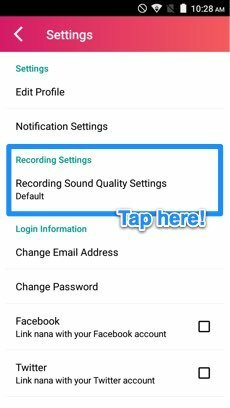 By adjusting the initial recording volume, you optimize the level of your track by centering the original sound and lowering noise and environmental sounds. 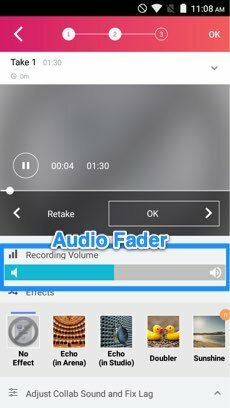 This optimized track will not be affected by changing the volume with audio fader, because its unwanted sounds are already minimized. Therefore you can adjust your track volume in any ways to create desired collab sound. 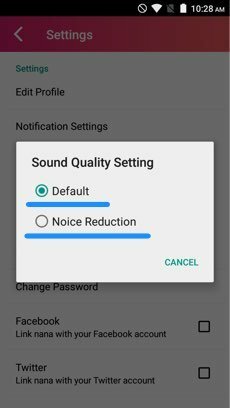 For Android users, there is an optional function of “Recording Sound Quality Settings” to lower noise level. **This function may not be effective depending on your Android device’s spec. Make the most out to enhance your sound! Now we’ve seen the basic tips of recording and mixing, you know how to get a good sound. Start recording and collaborating with others! Further tips will be revealed soon, so keep tuned!